The price is right if you’re looking to invest in gold! But, not just any gold. 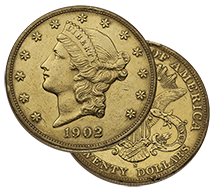 These are some of the most interesting gold coins produced in America – selling close to their melt value. And, they will take you back into time when gold was money and its currency value was in the coin itself. Many of you are familiar with high-quality gold coins - such as Saint-Gaudens or Liberties graded MS65 or higher. For every coin that receives such a high grade, there are many others that don’t. Junk gold offers you beauty, history, and most importantly, the gold you want without spending a fortune. Today, you can add the protection of gold to your portfolio through these easily recognizable and very liquid coins at a great price. The $20 Gold Double Eagle Liberty is a stunning coin that represents interesting history. This coin is the largest denomination of all regular U.S. coins, authorized by the U.S. Coinage Act of March 3, 1849. The first striking is considered so unique and historic that it is on display at the Smithsonian museum. The coins struck between 1849 and 1866 did not feature “In God We Trust.” The motto was added in 1866, above the Eagle on the reverse side. $20 Saints are considered to be the most beautiful coins ever produced by the U.S. Mint. They were first struck in 1907 at the personal request of President Theodore Roosevelt, designed by Augustus Saint-Gaudens. In 1908, the high relief version of the coin with Roman numerals were later changed to a low relief version with Arabic numerals due to difficulties in production. Ironically, another Roosevelt, President Franklin D. Roosevelt, ceased their production in 1933 when he outlawed private gold ownership in America. These $20 Liberties and $20 Saints are considered low premium. They are not slabbed in sealed casings, so you can hold these coins in your hand and imagine what it would have been like to actually use them as currency in the late 1800s and early 1900s. We have reserved a limited number of these coins for you. We expect these coins to sell fast, so we suggest you act soon! The gold price is on a decline as financial markets are expecting a higher probability of an interest-rate hike from the Fed. We believe one of the best precious metal values can be found in these junk gold coins. 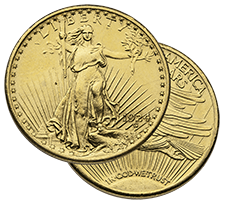 $20 Liberty and $20 Saint-Gaudens are available at $60 over melt value per coin*. Free shipping, handling and insurance available for purchases of 10 coins or more. Call us at 800-831-0007 or send us an email to purchase your junk gold today! Disclaimer: Prices are subject to change based on product availability and market fluctuation. Prices reflected are for cash, check, or wire transfer only. Free shipping, handling and insurance for purchases of 10 coins or more. Offer expires March 10, 2017.